Wine has been produced on this family-owned wine estate since 1695. The combination of exceptional terroir, situated on perfect aspects along the Stellenbosch Mountains, provide the basic ingredients for Kleine Zalze wines. The commitment to the highest quality by the relentless effort of the winery, along with international experience, has positioned Kleine Zalze wines amongst the best from South Africa. The top of the range of Kleine Zalze Estate wines. 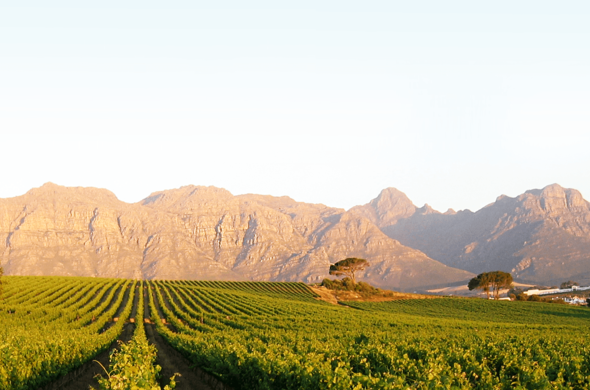 We only produce our Reserve from the best grapes of our vineyards on the farm. Reserve will only be available in limited quantities and only in certain vintages. Well integrated blackberry fruit and cedar wood aromas. On the palate an alluring combination of blackberries, chocolate and licorice flavours deliver a lingering aftertaste. The wine shows a lot of berry, herby, cigar box flavours with a hint of typical sweet Pinotage aromas. The ripe and well structured fruit tannins are well-integrated with the wood and gives the wine a long smooth aftertaste. As the name suggests, the wine is made from a selection of superior grapes from premium-quality vineyards. The best oak barrels are used and special attention is given throughout the wine making process. This limited range provides wines with flavor, complexity, structure and cellaring potential. This wine has a deep ruby-red colour with prominent spicy, blackcurrant and chocolate flavours on the nose. On the palate the wine shows hints of liquorice and mulberry flavours, that are well integrated with the wood flavours to give the wine a long lingering aftertaste. Rich in berry, cigar box flavours. On the nose the wine shows a good integration of French oak well-matured flavours. On the palate the wine shows soft integrated fruit tannin with a medium-long aftertaste. Rich in minty, berry flavours which are typical of the cool terroir where the grapes were ripened. The wine are backed with good fruit tannin on the palate with a long wood-matured aftertaste. The 2002 Barrel Fermented Chardonnay is a very elegant, well-balanced, medium-bodied wine. The citrus fruit flavours of the Chardonnay grapes are well integrated with the oak flavours which give the wine a long, lingering aftertaste. These wines are made to be more accessible and fruit driven. They represent good value, to suit our customers' tastes. This range reflects our motto: 'We make wine for people to enjoy'. Deep red colour. Classic, multi-layered Cabernet nose: leaves, earth, some chocolate, strong ripe berry fruit. Liquorice and black cherry palate - good flavour concentration with nicely judged wood. What a wonderful experience of apple, ripe fig and grassy flavours which carries through on the palate. The wine shows a good crisp complexity which ensures that the wine will have a good maturing potential after bottling. The well-balanced acidity leads to a crisp, fresh mid-palate taste. Strong lime, tropical, ripe pineapple aromas shows on the nose and are complemented by a long, clean, crisp aftertaste. This medium full style Chenin Blanc will mature for up to two years in the bottle. This is a smooth, medium-full style wine with good mango, ripe peach, citrus and lemon flavours. On the nose the wine shows ripe cultivar flavours which are well integrated with the citrus flavours and lemon toned palate.